We've seen these routines a thousand times and usually it happens at least once at every NBA game. Bring out the pad and the trampoline and let the dunkfest entertain the crowd during a timeout. The folks in Phoenix got a little more than they bargain for. 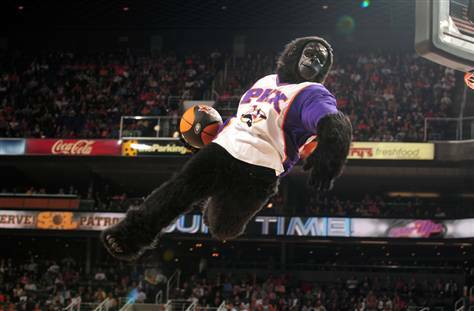 The Suns mascot Gorilla is steady pumping up the crowd as is the case near the end of the routine but one of the guys gotta a little too pumped as he gives a whole new meaning to ABOVE THE RIM as he goes through the rim, from above, full body and all on his dunk. Don't be impatient but if you are it's at the 1:26 mark. Ouch! Who wants to bet he had a good soaking bath on this night. Next week there will be a rule to take some of the spring out of the trampoline.